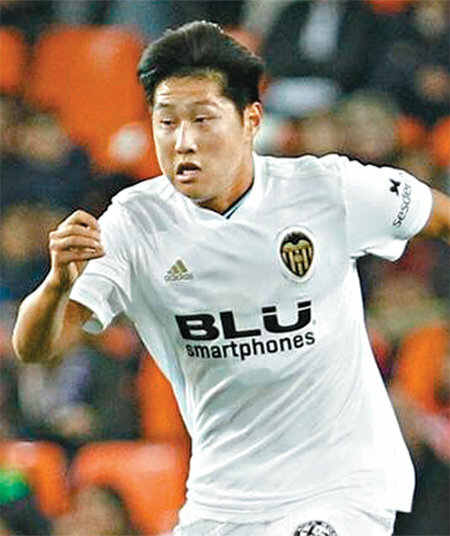 Valencia's Lee Kang-in close to clinching a first-team contract. January. 31, 2019 07:41. by Yun-Cheol Jeong trigger@donga.com. South Korean teenage football prospect Lee Kang-in is close to signing a deal with Primera Liga club Valencia CF to join its first-team squad, a Spanish local daily reported Tuesday. Spanish daily Deporte Valenciano reported on Tuesday that Valencia CF will soon announce Lee’s promotion to its first-team squad, receiving back number 16 and a buyout of 80 million euros. The Spanish club conditioned 80 million euros for a buyout last July, when it renewed its contract with Lee, who is with the club’s second-team squad until the end of June 2022. A buyout clause determines the figure required for a player to buy himself out of his own contract without his team’s consent. In Lee’s case, however, the 80 million euro buyout clause came with a string: It would take effect if and when he joins the first-team squad. Another Spanish daily Superdeporte reported that Lee’s buyout is 20 million euros until he is registered on the first-team squad. Valencia seems to be hurrying up its first-team contract with Lee, as he emerged as a recruitment target for other clubs following his good performances in first-team matches. A higher buyout in effect would help prevent him from signing a contract with another club. According to Spanish media reports, prestigious clubs including Spain’s Real Madrid and England’s Manchester City have sent their scouts to check Lee.